Pupils from Earby Springfield Primary School in Pendle are celebrating after securing a place at the largest youth sporting event in Lancashire, following victory in a quick sticks hockey competition. The school battled it out against eight other Pendle schools, and will now represent the district at the SPAR Lancashire School Games county finals in Blackpool, where they will compete against teams from 14 other Lancashire districts in a bid to be crowned county champions. Earby Springfield Primary School will be the first team to represent Team Pendle at the county finals in quick sticks, as the district has not entered this competition in previous years. Closely following Earby Springfield Primary School in second place was St Joseph’s Catholic Primary School, and taking third place was Sacred Heart RC Primary School. Pendle Forest Hockey Club assisted the eight schools by umpiring the matches throughout the competition. 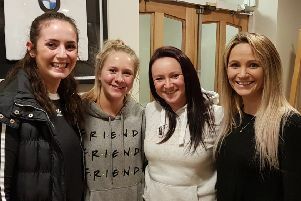 Fiona Callaghan, school games organiser for Pendle, who arranged the event, said: “I am delighted at the turnout for the first ever quick sticks hockey competition held in Pendle. “As the SPAR Lancashire School Games continues to grow, I am pleased that Pendle can add quick sticks to the already long list of sports we compete in. “In turn, I hope this opens more doors for youngsters within the area who want to get involved in competitive team sports. “The SPAR Lancashire School Games is all about taking part and having fun which is exactly what each participant did. “I would like to say a huge thank you to Pendle Forest Hockey Club whose support on the day was invaluable. Children across Lancashire will continue to battle it out in a range of sports to gain a place at the SPAR Lancashire School Games county finals which will be held at Blackpool’s Stanley Park on July 3rd. This year will mark the 12th year the county’s school games programme has been sponsored by James Hall & Company Ltd, the SPAR distributors for the north of England. Over £128m of National Lottery and Government funding has been invested into the school games programme.